Unveil riveting elegance and sparkle with the complementary beauty of the Raymond Weil® Freelancer watch. Two-hand analog display with quartz movement, and date display window at 3 o'clock. White mother-of-pearl dial face with 12 genuine diamond hour markers, and minute track at perimeter. 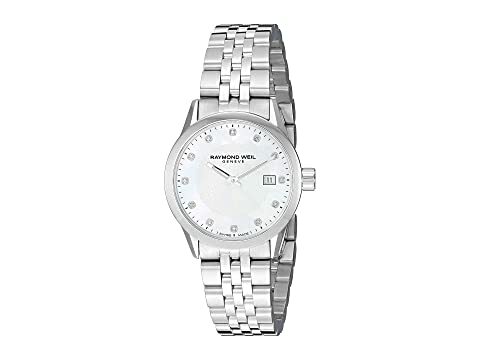 12 genuine single cut 8/8 diamonds total 0.05 ct.
We can't currently find any similar items for the Freelancer - 5629-ST-97081 by RAYMOND WEIL. Sorry!